Tracking your moods and knowing their ups and downs – and what exactly is causing them – can help discover valuable insights about your psychological health and improve your quality of life. The idea of the “quantified self" has gained a lot of attention over the last five years: we wear fitness trackers and want to know how many hours of sleep we get at night and how many glasses of water we have each day. This interest in monitoring health metrics has resulted in mobile apps and wearables that are meant to help us understand ourselves better. The idea of monitoring your emotional state isn’t new either – so-called mood diaries have been around for a while. They are seen as an essential component of treating various psychological conditions, including depression, bipolar disorder, and anxiety problems. Now, mobile apps provide a digital shell for these mood diaries, but they also can do so much more. What kinds of mood tracking apps are out there? Meditation apps stand out slightly from the list, and in this article, we’ll only focus on mood diaries and mood trackers. Sometimes these are two distinct types; sometimes mood tracking apps share certain features with mood diaries. What is the principle difference between mood diaries and mood trackers? 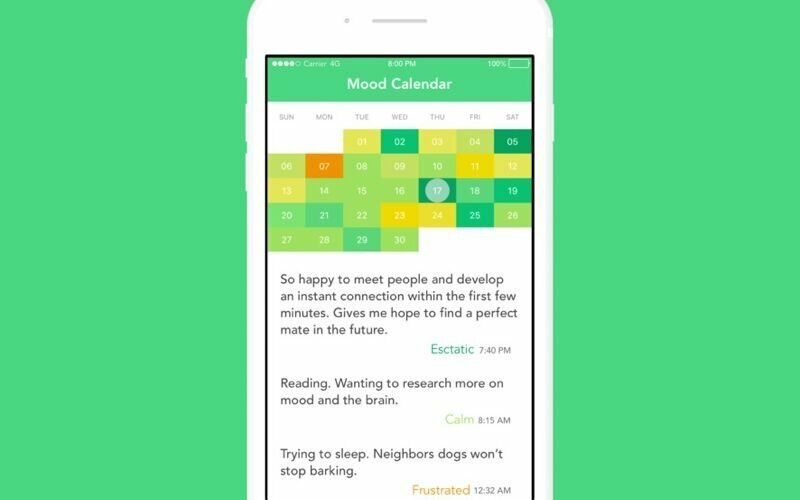 Mood diaries rely on users themselves putting in information about their emotional state throughout the day. Mood trackers can combine functions of mood diaries with an automated gathering of necessary information; for example, mood trackers can use wearables to monitor physiological responses like heart rate and blood pressure. It also creates graphs that display this data over time. Mood tracking applications are mostly developed for mobile devices, but web apps and wearables can also complement them and help create a lively community for a particular app. Let’s look at some of the most popular iOS and Android mood tracking apps that correspond to the types we described above and see what makes these apps stand out. Moodtrack Diary is one of the leading mood tracking mobile products. Its popularity comes from its flexibility: Moodtrack Diary allows users to record their emotional states without restricting them to a number of given options. Moodtrack Diary also provides a field for comments and rating of emotions on a scale from one to five, where one is the best and five is the worst. With the Moodtrack diary, entries are positioned along a timeline, where moods that users report more frequently are displayed in a bigger font than moods that are rarer. There’s a free version of Moodtrack Diary, as well as a paid one for $0.99; the paid version provides a more personalized experience. Moodtrack Diary is a really good pick for people who want to have freedom in tracking and reporting their emotions, but this app might be less popular among users who want to have more guidance in how often they report their emotional state. Moodlytics is a mood tracking app that offers a more in-depth experience, allowing users to look into the cause of their emotions and learn how to manage them better. With Moodlytics, users also can set specific goals. Moods in the app are presented as colorful emoticons, and users can customize the list of available emoticons. Users can also associate moods with images they attach to their posts or with a particular person they mention. Users of Moodlytics can set a reminder to rate moods on certain days of the week. The biggest disadvantage that people have commented on is that Moodlytics doesn’t let users indicate how strong their emotions are. Among the advantages of the product, Moodlytics users cite the fact that it’s possible to set several personal goals, which is important for therapeutic purposes. A paid version of the app ($1.99) automatically monitors goal progress based on mood ratings that are made within a certain period of time. Among more specialized apps, a lot of people who struggle with bipolar disorder work with Emoods Bipolar Mood Tracker. Emoods Bipolar Mood Tracker is designed specifically for people who are coping with bipolar disorder, and has a number of features specific to the condition’s nature. This app allows users to rate various emotions with a focus on feeling depressed and elevated and feelings of irritation and anxiety, using four levels of severity (none, mild, moderate, and severe). Users can also indicate whether they experience any psychotic symptoms. This app also lets users add a medication checklist. Emoods Bipolar Mood Tracker is really useful for people who want to monitor the core symptoms of bipolar disorder, plus get a more general overview of their emotional states. At the same time, the app could use more customization options, and a wider list of accompanying symptoms would also be useful. Pacifica is another popular app that uses tools based on cognitive behavioral therapy, mindfulness meditation techniques, and mood tracking. 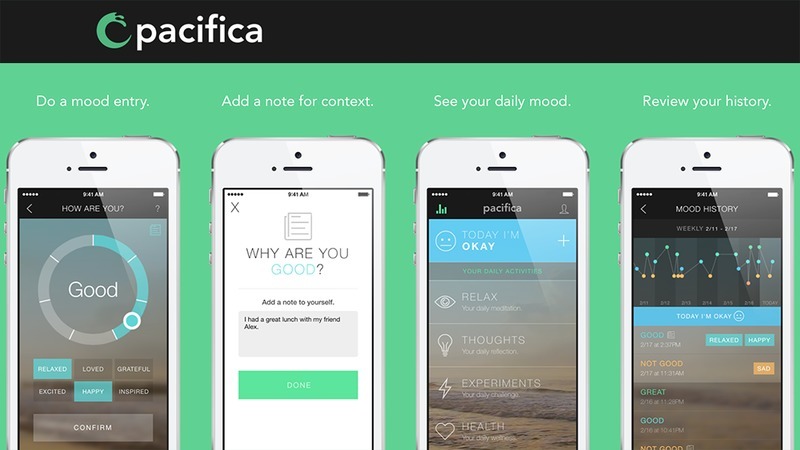 Pacifica combines a mood tracker with a health tracker. The app’s users get a chance to learn what triggers their anxiety. The app integrates with the Apple health app and provides data about exercise, sleep, and caffeine intake as all those factors can have a significant influence on a person’s emotional state. Pacifica also has a built-in thought analysis tool that was specifically designed by psychologists to show how certain thinking patterns and misconceptions contribute to anxiety. Another useful feature of the app has to do with setting personal challenges and goals and gradually working towards your long-term goals. Pacifica also focuses on peer support: users can contribute to the wellbeing of the app’s community by sharing their own stories and providing advice. Since the app was the result of the cooperation of various psychologists, its paid version is pricier than some of its direct competitors (a monthly subscription is available for $5.99, and a yearly one for $35.99), but a free basic version of the app is available too. Pacifica also has a web version for people who find it more useful for putting in detailed information. Mobile apps aren’t the only types of software that help people monitor their emotional states – there are some web tools that do the same, and wearables that complement various apps. Moodscope is a popular web-based tool where moods are presented with a card game. Moods can be added to a log where they can be seen and track individual progress of the user. A lot of mobile apps that track emotions can be used together with sensors and wearable devices, most commonly with fitness trackers. At the same time, there are a number of more specific sensors that are designed to help users analyze their emotions in depth. Spire, whose major function is to warn users when they start experiencing stress, is an example of such a wearable device. Spire detects stress by constantly analyzing the breathing and activity patterns of its wearers. Pip is another wearable sensor that captures the changes in levels of stress using electrodermal activity – data gathered from skin pores on a user’s fingertips. Pip is used with proprietary mobile applications and HIPAA-compliant platforms where all the data is stored. 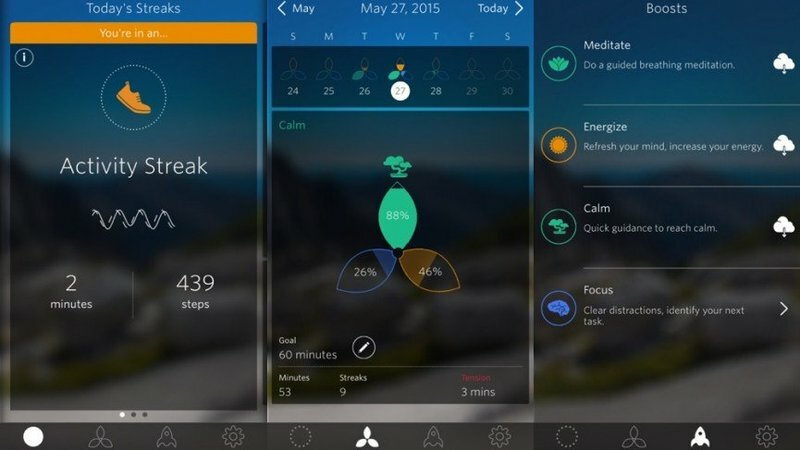 What are the most essential features of mood tracking apps? The diary part of an app allows users to enter information about the way they feel during the day. Over time, this information is accumulated and forms charts that display a user’s progress over time. Often, diaries ask for more detailed input than just an indication of emotional state; users are also expected to show for how long they’ve felt a certain way and what made them feel this way. It’s no secret that visualizations help us better understand and analyze complex sets of data. No wonder the most successful mood tracking mobile apps present overviews of a user’s emotions over time in the form of charts and graphs. Mood charts vary in their complexity, but they all focus on making it easy for users to spot times and places when and where their emotional state worsens, and helping them analyze what causes that. Reports are often created as PDFs and shared with users’ doctors. This is particularly useful for people who are visiting a psychologist and are being treated for depression or anxiety. Sharing this type of data requires security that is on a par with the security of medical apps. People often find it easier to acquire new good habits and battle psychological difficulties when they are surrounded by a supportive community. Most mood tracking apps base app’s performance on three big steps: measure, track change over time, and share information. Whether it’s your doctor or your friend with whom you share your ups and downs, sharing emotions can be beneficial for a lot of people. Integrating social features is more advantageous for mood tracking apps that are focused on general well-being and the formation of useful habits than it is for apps created to help people fight depression or cope with serious conditions like bipolar disorder. Developing a successful mood tracking application depends on a number of factors, including your target audience. You need to decide early on whether you’re aiming to build an app that’s considered a medical device and will be used for depression or bipolar disorder, because this would mean that you’d have to consider HIPAA regulations. The market for mood tracking devices and applications is rapidly growing as people realize that these apps are a great way to become aware of their stress and then work in an efficient way to manage it.